Other English name: Black Medick. 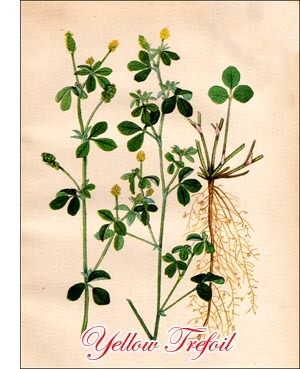 Trefoil is closely related to the Lucernes but is shorter lived. It is generally biennial but sometimes lives only one year. It has a taproot with comparatively few branches, about a foot deep on an average. The stems, which are developed in great number from the crown of the root, are decumbent or ascending. They often creep along the surface of the soil but do not produce secondary roots. The plants are therefore spreading in habit, especially as the stems are usually much branched. The leaves consist of three leaflets, each of which has a short stalk. The flowers are yellow, much smaller than those of the other species of Medicago mentioned, and in a short cylindrical head. Trefoil closely resembles certain yellow-flowered species of clover (Trifolium) but can be readily distinguished from them. In true clovers the blossoms do not fall off when flowering is over, but remain, withered, until the fruit is ripe, making the heads brown and hiding the pods. In Trefoil the blossoms fall off as soon as flowering is passed and the pods are therefore visible while ripening. They are small, kidneyshaped, rough-ridged and black-hence the name Black Medick. Each pod contains only one seed and falls off without breaking. Trefoil is indigenous to all Europe except its most northern parts, to northern Africa and to western Asia. It is not a native of North America but is rather common all over the continent, mostly growing like a weed. It has been cultivated in England for about one hundred and fifty years. From the beginning of the nineteenth century it began to be better known as a forage plant over central Europe. It is not cultivated in Canada to any extent. In the eastern provinces it is commonly found as an impurity in Red Clover and Alsike and must then be considered a weed, as it is overripe when the clovers are ready to cut. On account of its rather shallow root system, Trefoil is more independent of the subsoil than the lucernes and most clovers. It makes fairly good growth on rather poor land but succeeds best on soils not too stiff and wet. Lime is necessary for its proper development and a liberal amount of potash and phosphoric acid are beneficial. Although the roots are not very deep, Trefoil will endure a certain amount of drought without serious injury. It is only fairly resistant to cold weather. It prefers a medium warm climate and makes a splendid growth where moisture is abundant in the air and the soil. On account of its biennial or even annual character, Trefoil is most suitable for short rotations. Its decumbent branches and spreading habit make it of little value for hay as much of the plant escapes the mower. Its chief value is for pasture. It starts earlier than most pasture plants, grows up quickly, and produces quite a valuable green fodder. It stands close cropping remarkably well and for this reason is good for sheep. Its feeding value and yielding power being not comparable to those of Alfalfa or Red Clover, it should not be grown where these plants succeed. It should not be used alone for pastures and only to a limited extent in mixtures: too large a proportion is apt to prove detrimental to the other constituents. Although rather shortlived, it produces abundant seed and may consequently choke out other pasture plants. Twenty pounds of good seed are sufficient to cover an acre.